With a day to spare between my final exam in Seattle and a wedding in Oregon, I decided to continue working on my tour of the National Parks. 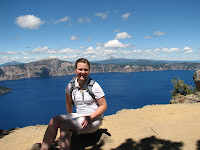 Today's destination was Crater Lake, Oregon, located in the south-central part of the state. Wow! What an impressive hole was made in the earth when Mount Mazama erupted and collapsed into itself about 7,700 years ago! The drive into the park in my red Toyota Yaris rental had the same effect on my knees as a thrilling roller-coaster drop. The white line of the road, which was crumbled at places, was the very edge of a 1000-foot cliff. There was no gaurd rail for my peace of mind. This was intense! I tried to drive in the middle of the road really, really slowly and I prayed that no car would come in the opposite direction. The lake is quite astounding, and well worth a scary drive. 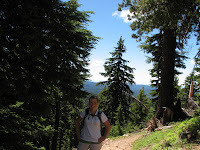 I hiked Garfield Peak (8,100 feet) from Rim Village (7, 100 feet). The trail was quite sooty, as if a volcano had erupted 7,700 years ago. There was not much wildlife along the trail. A park ranger told me that elk come out occassionally and that every once in a while a fox appears. I mostly saw butterflies, bees and flies! 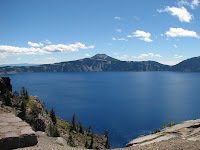 One very strange thing about Crater Lake is that it rarely freezes in the winter, but the area has snow that remains in the region throughout the summer. I walked by quite a bit of snow today, which was weird because I was wearing shorts and a t-shirt.